Binh Dinh (VNS/VNA) - Vietnam’s aviation industry has seen its strongest growth in the past decades with double-digit growth set in five consecutive years, but it is still faced with sustainable development issues. This was the theme discussed by aviation officials and experts at a conference to seek solutions for sustainable aviation development held recently by Giao Thong newspaper in the central coastal province of Binh Dinh. The network of domestic airlines has expanded rapidly with the participation of national carrier Vietnam Airlines and budget carriers Viejet Air, Jetstar Pacific, Bamboo Airways and Vietnam Air Services Company (Vasco). 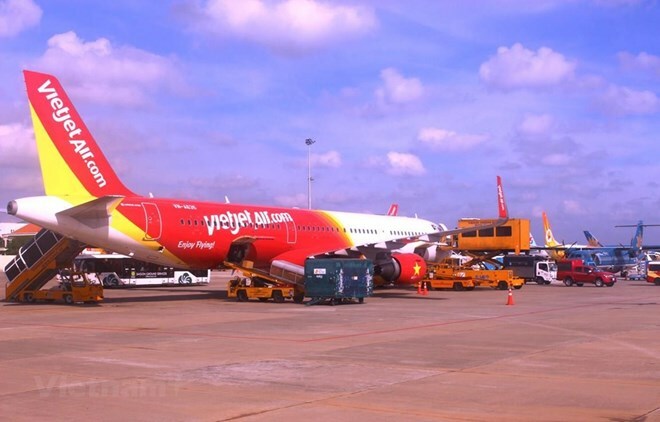 According to Deputy Director of the Civil Aviation Authority of Vietnam Pham Van Hao, Vietnam Airlines had been the main carrier, but now the likes of private enterprises such as Vietjet and Bamboo Airways had stepped in. “This has changed both quality and quantity. Vietnam's air route network has also experienced many changes and now has nearly 60 domestic routes and 130 international routes compared to 25 and 54 routes in 2008,” Hao said. Hao said in 2008, international flights mainly flew through Noi Bai, Da Nang and Tan Son Nhat airports. They are now connected to many other airports such as Cat Bi, Can Tho, Cam Ranh, Lien Khuong and Phu Quoc. “This has created relatively solid and sustainable development,” he said. “I want to emphasise that aviation must not only comply with domestic regulations but also internationally. With aviation, safety must come first. If you're just running after profit, you won't be able to ensure safety regulations, and you'll run into trouble. The history of aviation development has proven this. Safety not only determines the existence of an airline but also the honour and prestige of the nation,” Hao said. He said the aviation picture in Vietnam was beautiful at present thanks to the participation of the private sector, such as Bamboo Airways, SunGroup and Van Don Airport, bringing many benefits to the community and passengers. Fair competition in aviation would create benefits for both the community and the nation's reputation. Deputy Director of the Ministry of Transport’s Planning and Investment Department Tran Minh Phuong said the demand for air travel had followed the country’s economic development. Phuong said the ministry had advised the Prime Minister to adjust the aviation development plan. “The ‘hot’ development of the sector is positive because this is an opportunity to develop aviation and the air transport business. However, the growth rate is leaving airport infrastructure behind,” Tu said. "Another problem is the human factor. Airlines could mobilise capital to establish an airline and sign contracts to buy large aircraft, but human resources are a matter of concern. We have the facilities but there must be skilled operators to ensure absolute safety," he said. Economist Vo Tri Thanh said the most important thing in this area was that the State’s thinking about the role of the private economy and market economy had changed, and the private sector could now develop to its strengths. He said in the field of infrastructure investment, the private sector’s participation had helped implement complicated projects that required high-tech and strict standards such as airports and tunnels. “When participating in free trade agreements, private or foreign individuals are equal in the bidding for State investment projects,” Thanh said. "We need to encourage the participation of the private sector. All methods such as subsidies and social programmes must be transparent. That is the way to operate smoothly, turning to a healthy and competitive market economy." Director of the Civil Aviation Authority of Vietnam (CAAV) Lai Xuan Thanh said Vietnam was one of the fastest growing aviation markets in the world. The development of aviation was always under the control of the State, so it would be implemented following the aviation transport development strategy approved by the Prime Minister. Under the strategy, about 104 million passengers will use air routes by 2020. The figure will reach 308 million by 2030.